I know, I know, I haven't posted in like a month. Well, I've been busy! Once the Christmas season is over I'll be back posting regularly, I promise. 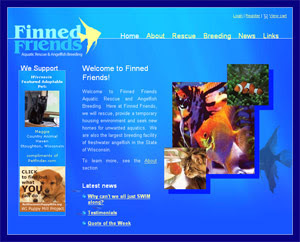 But for now, I'd like to announce the launching of the site Finned Friends! It is the site of the only fish rescue in Northern Wisconsin, and also the largest Angelfish breeder in Wisconsin. I designed the site (including the nifty little background fishies). Its database driven and fully customizable for the owner, without having to know anything at all about HTML. Hooray!